When I am at home I like baked casseroles. I especially like Chicken Divan baked in the oven because it is one of those rich comfort foods that makes me feel warm and cozy on a cold night. I was reminded of this dish recently when the weather turned cooler. I just happened to have some fresh broccoli and some leftover roasted chicken that I picked up at the store for dinner the night before. 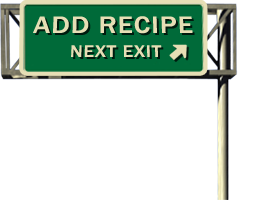 I did a little redesigning and came up with an amazing stovetop version that is both easy to make and tasty. The Hatch green chilies add an important roasted pepper depth to the dish which I think is required, but feel free to expermient with whatever you have handy. Chop broccoli in small (bite sized or smaller) pieces. Steam or par-boil the broccoli for a few minutes until color is bright green. Drain and turn out into a bowl to rest. Heat the soup and milk in a pan until almost bubbling. Slowly add cheese while stirring to ensure even melting. 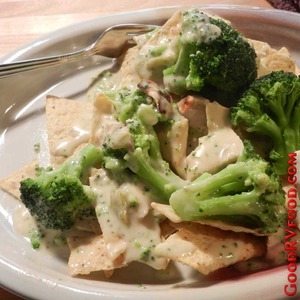 Add green chili, broccoli and cooked chicken to mixture and heat completely but do not boil or the cheese may curdle. Serve topped with crumbs and small broken pieces from a bag of tortilla or corn chips.